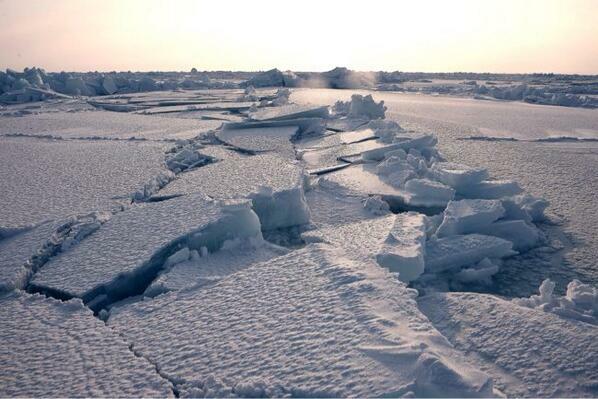 Jim Hunt's photo of ice breakup at high tide on another thread shows the effect of the moon on sea ice. Now it's on this one too! A large area of ice has vanished over the last 2 or 3 days. Bad luck: we get a rare (night view, but this is the Arctic) Landsat 8 image of the first Nares blockage and then it is clouded. Just outside the front door of the Nares Strait the ice has unstuck. First test for the sturdy stopper. Another few days should tell just how sturdy our stopper really is. We can only be days away from the opening of Nares Strait, the cracks from Lincoln Sea is now entering Nares Strait from the north, another interesting aspect is the "open" sea north of Ellesmere Island near and around Ward Hunt Ice Shelf etc. On this landsat image cracks are appearing now in the ice on both sides of the sturdy stopper. Do you know how it compares to either 2013 or 2012 at the same time of the month? Cracks are appearing now in the ice on both sides of the sturdy stopper. This Landsat image sure beats the available Modis imagry for making enlargements! I don't think it is much use to compare individual years. Last year the giant iceberg from Petermann glacier held the ice in Nares strait long together. This year we have this rather unusual big piece of ice creating a blockage. At least for last year you can look at older messages in this thread. Also watch the posts from Dr. Andreas Münchow, very informative. Yes and this time I choose to post a 30m res image. A 15m res version would be about 12MB, which I think is just too much. "This year we have this rather unusual big piece of ice creating a blockage." I don't think this plug is a problem, since it only exported sea ice from the north and probably a bit thicker than the average Nares sea ice. Did the sturdy stopper just get split in half? It's pretty cloudy, but a heavy dark line appears in both the latest Aqua and Terra images on Worldview. No, that's just the pronounced boundary of a cloud field and its shadow. If you add the 3-6-7 false colour imagery, you'll clearly see the difference between the white clouds and the red/orange ice/snow underneath. Did the sturdy stopper just get split in half? Aqua 7/2/1 suggests it's cloud? Whew, sorry for the false alarm, everyone. Another beginner mistake. That did seem a rather spectacular way for the breakup to begin, but with occasional ice movement in the Lincoln lately, it did seem possible. Otherwise, ice has been getting blue around the margins of of Nares but still seems solidly white up and down most of the length, hm? I try to resist making predictions but I sure like to watch. It also seems that as the warmup progresses, some patches darken in the radar images. I make guesses, but I really have no idea what it means. I made the same mistake. To a layman, it sure looks like an unlikely crack! I have tried to read up on this but maybe you can explain this more quickly, polynya88. Why do the ASAR images show a "bright side" and a "dark side" on mountainous regions, the direction seems to change in different passes. I think it is do with the interferometry system using two emitters meaning that what the light / dark intensities show is actually gradients in elevation, i.e. it shows roughness more bright than smooth surfaces. Does that fit with your experience? Radar is a side-looking sensor, so targets that are perpendicular to the look-direction are bright. Also, due to the incidence angle of the imaging beam, the back-side of large features are sometimes in a radar shadow, thus black in tone. Rough surfaces produce a bright tone, smooth ones not so much. The satellite platform is in a different location/orbit for every image, so the look direction, incidence angle, and azimuth is always changing thus bright targets vary with each pass. I like to speculate about the mechanical forces an ice arch, and one thing I've been wondering is if the Huboldt glacier plays a part. It's easy to see the ice-water boundary and think of that as the arch, but I wonder in this case if advancement of the glacier doesn't add enough compression to make the "real" arch a broad band stretching from the Humboldt across to Ellesmere. Radar is a side-looking sensor, so targets that are perpendicular to the look-direction are bright. Also, due to the incidence angle of the imaging beam, the back-side of large features are sometimes in a radar shadow, thus black in tone. Rough surfaces produce a bright tone, smooth ones not so much. Yes, and if a digital elevation model is available the inherent distortion in radar images can be corrected in a process called geocoding/orthorectification and radiometric terrain correction. the problem is that the DEMs of northern areas are not always that great. The satellite platform is in a different location/orbit for every image, so the look direction, incidence angle, and azimuth is always changing thus bright targets vary with each pass. Partially correct, the radar orbit repeats itself within an orbital tube of a few hundred meters, so for most practical purposes there are a limited number of imaging geometries, that divide into two groups, namely images from ascending or descending orbits. Ascending and descending scenes map the terrain from two almost opposing directions, so the image distortions are very different in these two types of scenes. With a good DEM the distortions can be corrected, however. Correct you are. I didn't realize the orbit varied by only a few hundred metres. But if we are getting into details anyhow, there is also the issue of signal polarization. The polarization of the sent and received radar signal has a big effect on how things are depicted on an image. Attached is an example of quad polarization radar of an ice island - tone of an ice island can be near black or near white; you pick! Please click on image to enlarge! The remaining arch this morning struck me as looking like a flying buttress. Now, we don't expect it to hold back Ellesmere Island from collapsing on Greenland, but if you pick the Humboldt as your frame of reference, maybe Ellesmere does seem to be pressing in? There's a nice cloud-free view of the Nares from space currently. A few new small cracks are visible. I'm rather fond of side B of the 45 rpm record on which that song was released. Nice little detail in that last image: Hans Island produces a subtle vortex street, thereby indicating the northern wind over Nares Strait. Gosh, what terrible image! There must be some problem in the decoding or reconstructing or something. There's a clear shot of it on worldview http://1.usa.gov/1ofJCqP take a look at that glacier on Ellesmere too. It is a prelim image. That's better What an amazing catastrophe. I know, it's an annual thing, but it's still awesome. Neven's Nares breakup special edition should be soon now. But there's still a little suspense in how long the remaining ice will last. I think it was last year that an arch just below the Hall Basin hung on for several days before succumbing to the inevitable. Earlier this week I looked at the little crack that formed at Franklin Island and wondered if the arch it formed would be sturdy. But nope! today's images show a whole succession of arch-shaped cracks blowing right by it. It's also fascinating to me that this breakup happens in the "white" ice more than in the "blue" ice. Somehow I imagine the blue ice softer. Maybe that's just it. Maybe it gives a little, while the more brittle ice is forced to crack. The suspense will shift soon to the Lincoln. MYI was being lost at an astonishing rate last year before the "sturdy stopper" ended the export season. Since then there was that big fracturing event in the Lincoln, and most recently polynyas have appeared on either side of the Lincoln. Neven's Nares breakup special edition should be soon now. I will try to put something up at the end of the week. I invested a lot into the latest ASI update, so I want that to stand for a while. Hmm, there seems to be some kind of misunderstanding. I think we both have the correct spot as Hans Island in our mind. So just to clarify I added some labels to the satellite image, the vortex street is marked by red lines.